Reading Newspaper is one of the best habits of a person. But do we follow it daily? Many of us are not even comfortable with reading an English newspaper. Let us make it easy for you. We will provide you daily Hindu Editorial as well as current affairs videos. You will also be given PDF based on the video content. Stay with us. It will definitely boost your GK and help you in your competitive exams like Banking, SSC, UPSC etc. Let’s begin by watching today’s Video and checking the important headlines for the day. In this section, we cover all the important current affairs which you should be aware of. We provide daily videos and pdfs for the same. Today’s session will cover all the October (1-15th) Current Affairs. Live Video will be started at 1:00 PM Today. You can also check the previous sessions which cover Sabrimala Temple, Aadhar, Zika Virus etc. You can also go through the short notes of the previous current affairs videos. 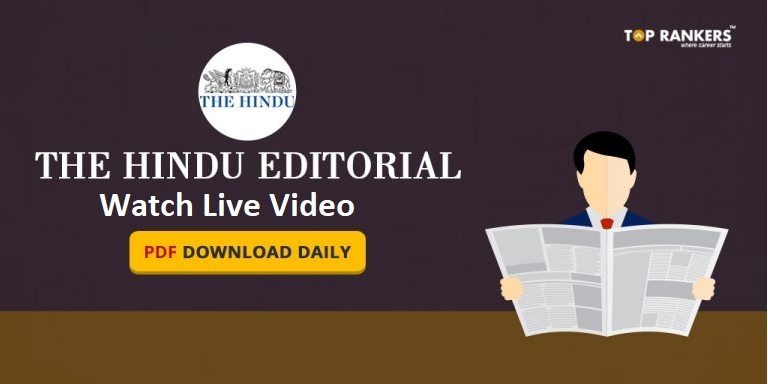 In this section, we discuss the Daily Hindu editorial so that you do not miss any important news. As you must have heard that Editorial section of The Hindu is very good if you want to improve your reading skills, vocabulary. Do not miss today’s live session at 3:30 PM. You can also check the previous sessions if you have missed any. Explore the Daily Quiz Feature and let us know if you like it. We will be posting more such videos daily. Stay with us and keep updating your knowledge. In case of queries, post it in the comment section.